Help organize client assets in one place. Use easy to understand pie graphs to illustrate points. Where Is Your Client's Red Line? Help clients determine what their retirement may hold. Provide recommendations to help alleviate the red line. Pivot to find the correct solution for each client. Help visual clients connect the dots. Use colors to simplify complicated financial concepts. 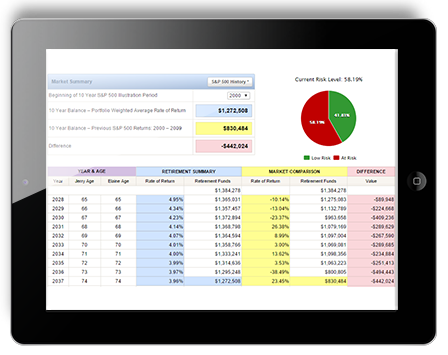 Provide custom professional looking reports. 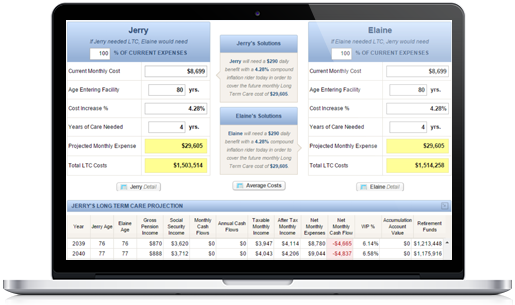 Help clients determine the correct amount of insurance coverage needed. Provide your client solutions to make coverage affordable. Show and illustrate the many uses of life insurance. Help clients prepare for the onset of necessary long term care. Show how escalating costs can drain retirement funds in quick fashion. 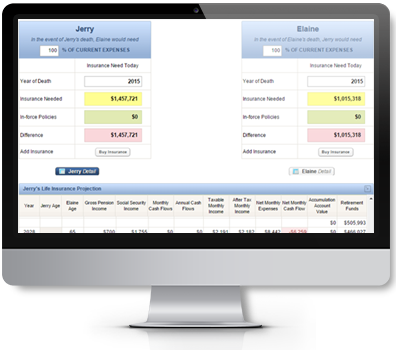 Help clients determine the correct amount of insurance to counteract costs. Can Your Client Handle a Market Downturn? Illustrate historical periods and their effect on client retirement funds. Help your clients determine a suitable level of risk. Work with clients to move assets to create desired allocations. Join our live training sessions daily to get acclimated quickly. Participate in our team teaching approach. Convenient Virtual Track training from your home or office. In today's world, it's all about simplification and providing easy to understand solutions to help your clients analyze where they are and what they have to do to be successful. 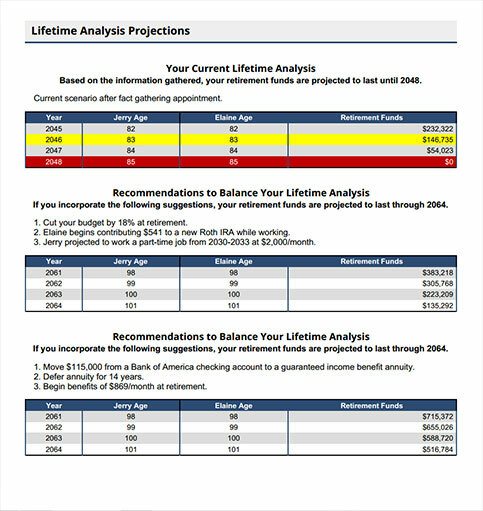 With that in mind the Retirement Analyzer software program has the following features. Designed specifically for the life insurance licensed producer. Show clients what their financial futures may hold, make recommendations to alleviate problems and use products to enhance retirement scenarios. Designed specifically for the registered advisor. 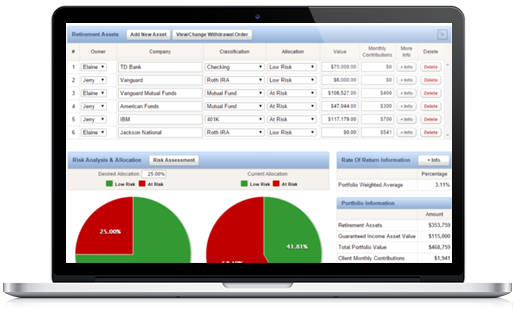 Everything the Pro Version offers plus provide your clients with an asset allocation analysis, risk assessment and an S&P Market Comparison. Around the clock access too our pre-recorded training clips designed to help answer your questions and get you acclimated to the software quickly. 12 information-packed hours of education presented over a 4 week period. Make no mistake about it, this is "roll your sleeves up appointment training" designed to help you increase closing ratios all from your home or office. Live interactive support taking place on Fridays from 10 am - 11 am CST. Join our larger group discussion on issues that advisors face in the field today as we touch on best practices when it comes to building a successful business. 10 am - 11 am CST to get answers to your specific questions and take part in our discussions. 8 am – 5 pm CST. We will spend the time with you to make sure you get the most from your software subscription. Designed to help you communicate and compare notes with fellow software users at any time. Ask a question, post a comment or simply like a response as we all work together to become better advisors. Our way of keeping you up on world and financial news. Choose from a number of financial website links to check a stock, mutual fund or research a story of your choice. 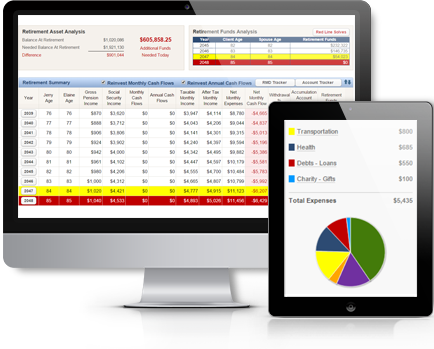 Important financial information at your fingertips when you need it most. Fact Packs are one pagers that provide financial data in an easy to understand format. Whether you are talking inflation, Social Security or taxation there is a Fact Pack in your locker that can help. Access to your very own user locker stocked full of valuable information to help make you efficient when it comes to fact gathering, analysis presentation, recommendations or product suggestions. Our seminar program is designed to be simple and to the point. We understand that you have 40-45 minutes to showcase your personality and wow your crowd. Branding using your company logo, colors and family pictures is included in the package. Gathering facts to create a client’s current scenario or present circumstances. Helping your client obtain balance or better their current scenario by incorporating your recommendations. Enhancing balance with specific product suggestions. Once you enhance balance, make sure the plan can weather the effects of premature death, a LTC facility stay or market correction. Repeat this process from client to client as you build your business. Before making a decision.. We offer a 14-day free trial to let you test drive the program. Join us and our team for a month of introductory webinars, interactive support, individual coaching and access to our proven repeatable sales process. We realize that selecting a software program to incorporate into your business is an important decision which takes time. We find that the 14-Day trial will go a long way in making your decision. We understand the task you have in front of you, getting acclimated to a new software program and integrating it into your business. Let’s face it, change takes a commitment of time and effort and all of us here at Thomas Gold have been through it. 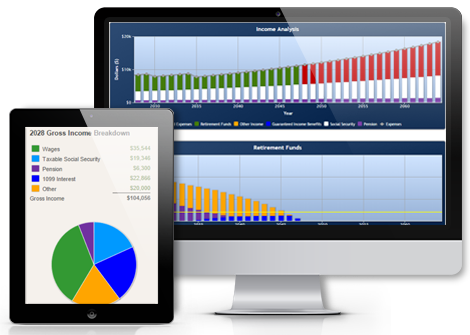 Being advisors in the field today, we use the Retirement Analyzer with each and every one of our clients which helps us write effective software. From day one, you will experience what it is like to be part of the Thomas Gold team as we help you get up and running as soon as possible. Whether you join our team from our 14 day trial, as an individual or part of a group subscription, we will do whatever we can to make sure you have the best possible user experience with the Retirement Analyzer program. You will quickly come to realize that we go the extra step with regard to support. You will gain access to our Power Hour interactive training sessions from Monday through Thursday and our special Success in 60 Friday coaching call sessions, all designed to keep you on track. If you want to supercharge your software acclimation process, we suggest our quarterly 4-week Virtual Track Training. After 4 weeks of this intense training, we find that you are ready to hit the ground running. So there you have it, our differentiator. Refreshingly simple software and exceptionally good support. Getting you to a point where you feel comfortable in your appointments and able to answer any client questions with a couple of keystrokes. Come and join our team as we do everything necessary to help you increase your closing ratios and become more successful. Brooke is a graduate of the University of Idaho and resides in Arizona. Brooke began her career in the financial industry in 2005 where she quickly became a highly successful agent in the field earning over $150,000 of commission during her first year in the industry. Brooke began with Cravens & Associates in 2007 and has played a major role in the development of the Retirement Analyzer Software program. After the passing of her partner Chuck Cravens, she successfully guided the company until she teamed with partner Steve Goldstein to purchase Cravens & Associates and form Thomas Gold Solutions. Her experience as an agent helps in the development and creation of software solutions that are comprehensive yet easy to understand by agents and clients alike. Brooke brings a wealth of knowledge and experience to TGS. Brooke is also one of the Founders of Dakota Wealth Solutions, an RIA, and has an increasing client base. She currently holds her 65 and Insurance Licenses. Steve is a graduate of Drexel University and resides in New Jersey. He began his financial career in 1983, working on Wall Street for 22 years trading stock and index options in New York, Philadelphia, Chicago and Frankfurt, Germany. Steve was a Senior Partner at Liberty Capital Group through the late 90’s as well as an FMO Senior Vice President of Sales and Marketing from 2008-2010. Steve has traveled the country conducting financial seminars in order to help clients better understand the retirement planning process. In 2010 Steve teamed with partner Brooke Thomas to purchase Cravens & Associates and form Thomas Gold Solutions. His experience as an advisor is an asset when creating software solutions that help users develop a repeatable sales process, increase production and become more successful. Steve is one of the Founders of Dakota Wealth Solutions, an RIA, and has an increasing client base. Steve holds his 6, 63, 65 and Insurance Licenses along with the CFP® and ChFC® designations. Cheryl grew up in New Jersey, but moved to Arizona in 2004 where she currently resides with her husband and two children. Before becoming part of the Thomas Gold team, Cheryl had a vast amount of experience working both in the financial world and with software companies. Her most recent employment was with McCormick Systems in Chandler, AZ, where she helped new software users to get up and running. This combination is what has made her a perfect fit for Thomas Gold. Cheryl focuses on working with the Retirement Analyzer Software users to help them jump start their acclimation process and to make sure that each and every user has the best possible user experience. Shae is a graduate of University of Phoenix and resides in Washington State. Her extensive experience in sales and customer service makes her a perfect fit for our Thomas Gold team. Shae focuses on spending the necessary time with new users, to help them jump start their Retirement Analyzer acclimation process. She will go the extra step to help each and every user have the best possible software experience. You can find Shae on our Power Hours, Monday through Thursday at 10:00 am CST and our Powerline from 8 am to 5 pm CST each business. Danielle is a graduate of Rutgers University and currently resides in Western Pennsylvania. Danielle works to support software users of all levels. Her role continues to grow as we expand the number of Retirement Analyzer users and you can catch her on the Thomas Gold Power Hour & Thomas Gold PowerLine each week, helping users get acclimated to the software. Danielle also heads up the planning and scheduling of all in person software training sessions and provides monthly user reports to our enterprise clients. Danielle holds her PA Insurance License. Chuck Cravens spent 30 years as a high level insurance producer, helping clients take the confusion out of retirement planning. Chuck was one of the first to recognize that use of a computer and a specialized software program would play an important role in the education of clients and the development of their financial plans. He began using a computer and software programs in 1978 in order to give clients a glimpse into their financial futures. Chuck founded Cravens & Associates in 1985 with the idea of creating his own software program for financial advisors and agents, which would simplify the fact-finding and financial planning process. His dream was to develop a program that could help many and be understood by all. He took his 30 years of industry experience and used it to create a simplified yet detailed software program called the “Retirement Analyzer.” Chuck knew the importance of helping agents build their businesses while promoting client understanding and the RA does both. The RA is now being used across the nation by some of the most respected financial marketing organizations and individual advisors. In keeping with Chuck’s dream, Thomas Gold Solutions continues to grow and prosper as we help marketing organizations, broker dealers, advisors and agents to increase business and become more successful. © 2019 Thomas Gold Solutions. All rights reserved. We offer many options when it comes to group pricing. Give us a call at 1-800-854-6621 to discuss your situation and we will tailor a plan to fit your specific needs. If you do not have an account, please register, sign up for a trial account, or sign in under your group subscription. This web site and the materials contained herein are a conglomeration of information made available to agents in assisting consumer retirement planning. Thomas Gold Solutions is not responsible for assumptions, projections and conclusions reached by the agent or the consumer. While Thomas Gold Solutions has made every effort to maintain accuracy of information provided by this site, it cannot and does not GUARANTEE the accuracy of all calculations and is not responsible for errors and omissions. Any errors or discrepancies, noted, should be reported immediately to Thomas Gold Solutions so they may be corrected. Effective 11/01/2010 Our Commitment To Privacy: Your privacy is important to us. To better protect your privacy we provide this notice explaining our online information practices and the choices you can make about the way your information is collected and used. This notice applies to all information collected or submitted on the website. On some pages, you can order products, download software, and register to receive materials. The types of personal information collected on these pages are: Name, Address, Phone Number, E-mail Address, Credit/Debit Card Information. We use the information you provide about yourself when placing an order only to complete that order. We do not share this information with outside parties except to the extent necessary to complete that order. We use the information you provide about someone else when placing an order only to ship the product and to confirm delivery. We do not share this information with outside parties except to the extent necessary to complete that order. We use return email addresses to answer the email we receive. Such addresses are not used for any other purpose and are not shared with outside parties. We never use or share the personally identifiable information provided to us online in ways unrelated to the ones described above without also providing you an opportunity to opt-out or otherwise prohibit such unrelated uses. To prevent unauthorized access, maintain data accuracy, and ensure the correct use of information, we have put in place appropriate physical, electronic, and managerial procedures to safeguard and secure the information we collect online. To protect your privacy and security, we will also take reasonable steps to verify your identity before granting access or making corrections. Should you have other questions or concerns about these privacy policies, please call us at 800-854-6621 or send us an email at info@thomasgold.com.